It’s our first 4th of July in New York, and we were excited to head out into the city to see the fireworks first-hand. Unfortunately a thunderstorm warning got in the way, our plans to have a picnic at Central Park had to be reserved for another occasion. 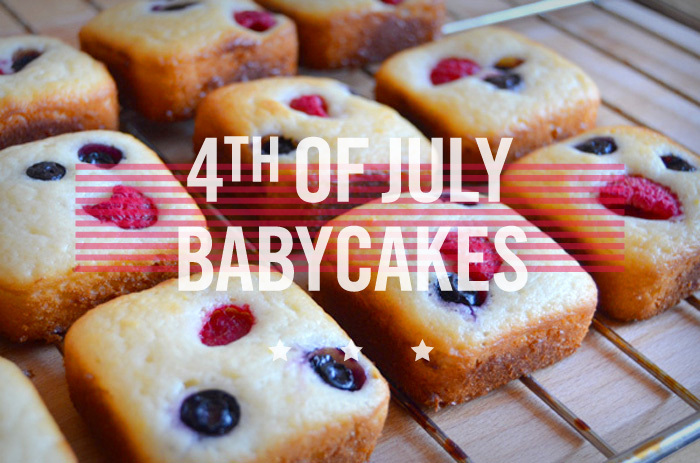 I had already decided that I was going to bake these (conceptually) red, white and blue babycakes so I proceeded to alter my tried-and-tested lemon cake recipe for them. Most of the ingredients you’ll need — I forgot to take out the eggs. Preheat the oven to 180C/350F. 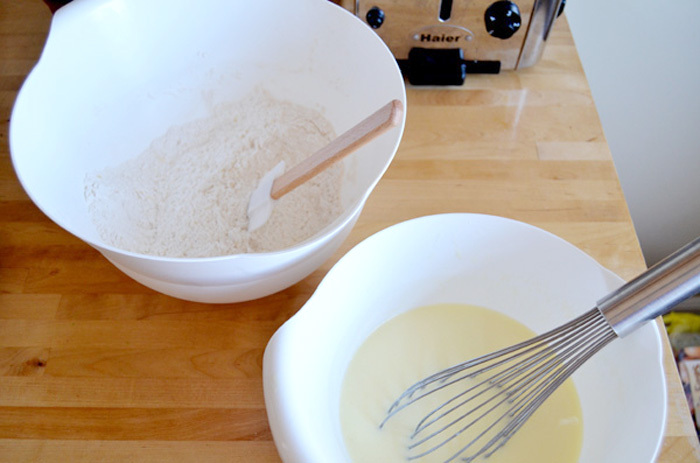 It’s a very simple recipe — mix the dry ingredients (self-raising flour, sugar, lemon rind) together in a large bowl. 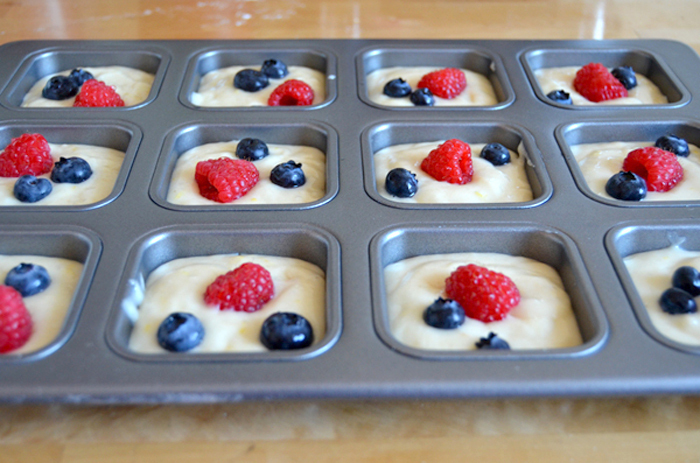 Mix the wet ingredients (oil, egg, yogurt, and lemon juice) together in a small bowl. 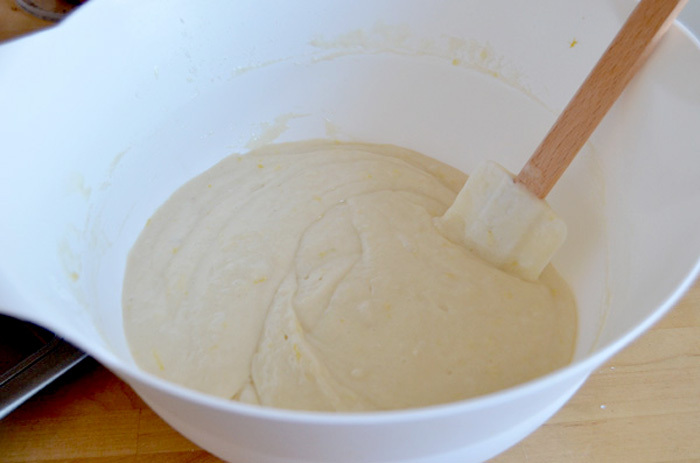 Mix the wet and dry ingredients together to make a smooth batter. You could mix everything together at once but I find this method to produce an evenly mixed batter much quicker. 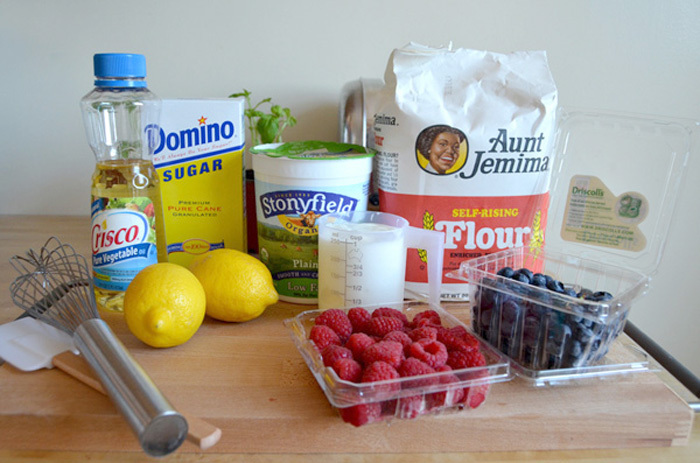 This recipe is not as sensitive, but with other mixes (with egg whites, for example) minimal mixing can be a good thing. 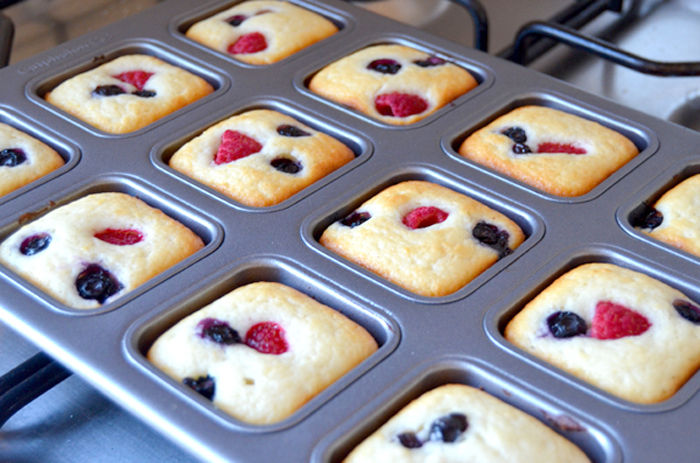 I used a dessert bar or mini brownie tin this time around, filling it 2/3 the way up and placing a few berries in each. Bake in the oven for 15-20 minutes or until a skewer comes out clean. I like to have a little bit of colour on the tops. And here they are! 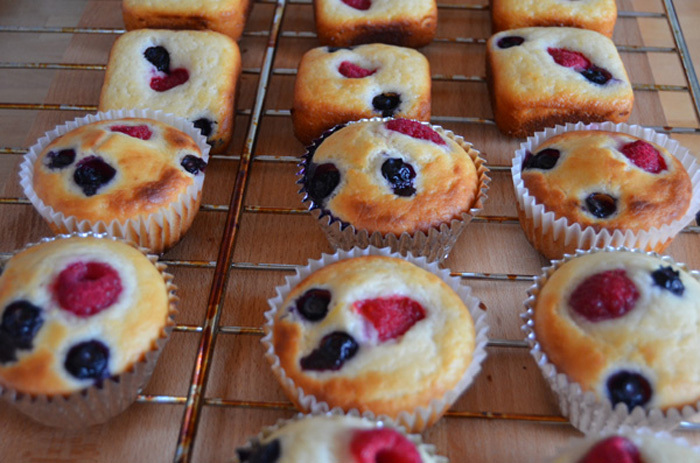 I’m still getting used to the new oven, but these turned out ok considering it’s the first time I’m baking with it. 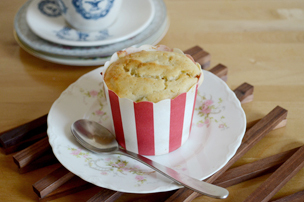 I got this recipe from my an old workmate, and have used on many occasions replacing the lemon with milk, adding vanilla, using them to make iced cupcakes — it really is foolproof and they come out moist and fluffy every time. 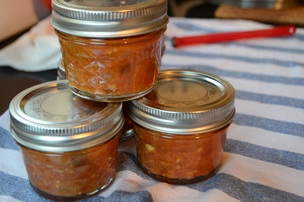 I love the simplicity of the recipe, and uses mostly pantry ingredients. I have made it much healthier than the original version that was given to me, and I like that it doesn’t have huge amounts of butter. 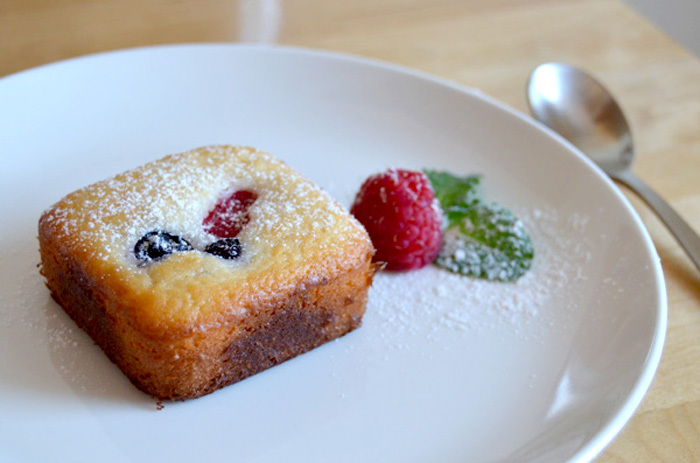 Those with a sweet tooth could put the sugar back in… or be creative and add honey, maple syrup or jam to change it up. I will at some point put the original version on here because I really love them too. Happy 4th of July!